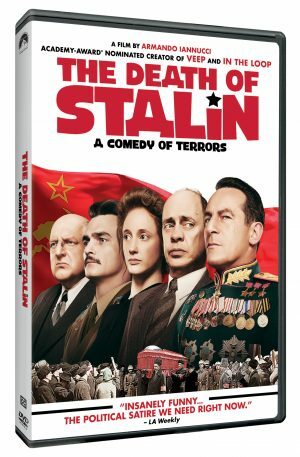 Banned in Russian cinemas, the brutally executed parody “The Death of Stalin: A Comedy of Terrors” arrives on DVD and Digital Tuesday June 19, from Paramount Home Media Distribution, it was announced today. The film will also be available for sale or rental from cable, satellite and telco providers through IFC Films. Written and directed by Emmy Award winner and Oscar nominee Armando Iannucci (“Veep,” “In the Loop”), the star-studded comedy follows the tyrannical ruler’s hapless inner circle in the days after his death. As they scramble to come up with the next evolution of the revolution, it’s clear everyone is really out for themselves. “The Death of Stalin” stars Emmy and Golden Globe winner Steve Buscemi, Simon Russell Beale, Rupert Friend, Andrea Riseborough, Jason Isaacs and Michael Palin. The DVD includes a behind-the-scenes featurette entitled “Dictators, Murderers, and Comrades…Oh My!”, as well as deleted scenes. The disc is presented in widescreen enhanced for 16:9 televisions with English 5.1 Dolby Audio, English Audio Description and English subtitles. More crazy hijinks are in store with the imminent release of “Jackass: Complete Movie and TV Collection,” which is set to hit store shelves Tuesday May 29, also being released by Paramount Home Media Distribution. Johnny Knoxville, Bam Magera, Steve-O, Chris Pontius and Jason “Wee Man” Acuna are all here doing their crazy stunts and silly pranks. The set boasts 16 hours of “extreme stupidity” on 11 discs. The box set includes “Jackass: The Movie,” Jackass Number Two,” “Jackass 2.5,” “Jackass 3,” Jackass 3.5,” “Jackass Presents Bad Grandpa,” “Jackass Presents Bad Grandpa .5,” and “Jackass Television Collection.